Media captionBack from the dead? The security services then informed Babchenko, apparently determining that the only way to reveal the plotters was to stage a fake hit. 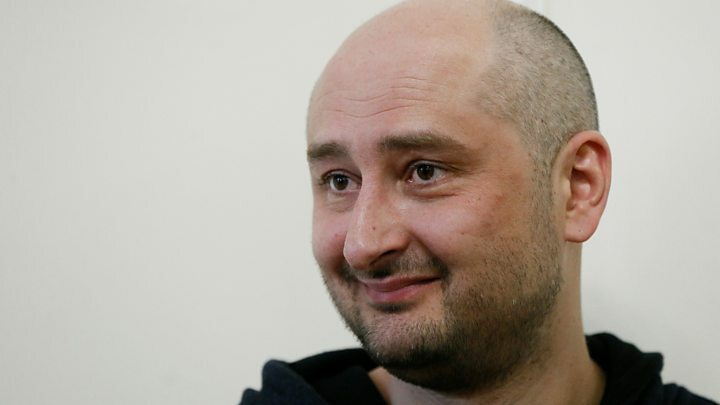 Babchenko said that his wife Olga and his children had been aware of the plan but he publicly apologised to her at the press conference. "I am terribly sorry," he said, "but there were no other options." Mr Hrytsak said the man detained by police was the Ukrainian who had allegedly attempted to find a hitman. Russia's foreign ministry condemned the staged assassination, calling it "obviously yet another anti-Russian provocation". Spokeswoman Maria Zakharova described the operation as "a masquerade" done for "propagandistic effect". She added that Russia was happy that Babchenko was alive, saying: "I wish it were always like that." Ukrainian President Petro Poroshenko said the country would offer protection to Babchenko. "It is unlikely that Moscow will calm down," he said on Twitter. "I've given an order to provide Arkady and his family with protection." The Radio Free Europe/Radio Liberty network posted video footage of Babchenko's colleagues reacting to news that he was alive. But many expressed reservations over the tactics used by the Ukrainian security services. Campaign group Reporters Without Borders condemned the operation as a "pathetic stunt". "It is pathetic and regrettable that the Ukrainian police have played with the truth, whatever their motive," the head of the organisation, Christophe Deloire, told AFP news agency. The Committee to Protect Journalists demanded that the authorities explain "what necessitated the extreme measure", describing it in a tweet as an "unprecedented situation". Russian investigative journalist Andrei Soldatov, a former colleague of Babchenko, said the sting had "crossed a line big time". "Babchenko is a journalist not a policeman, for Christ sake, and part of our job is trust, whatever Trump & Putin say about fake news," he wrote on Twitter. "I'm glad he is alive, but he undermined even further the credibility of journalists and the media." Simon Ostrovsky, a journalist and friend of Babchenko, told the BBC he felt "anger and relief in equal measure". “From being incredibly gloomy and sad yesterday... to frankly anger today, we’ve all been hoodwinked and made to believe our friend died." 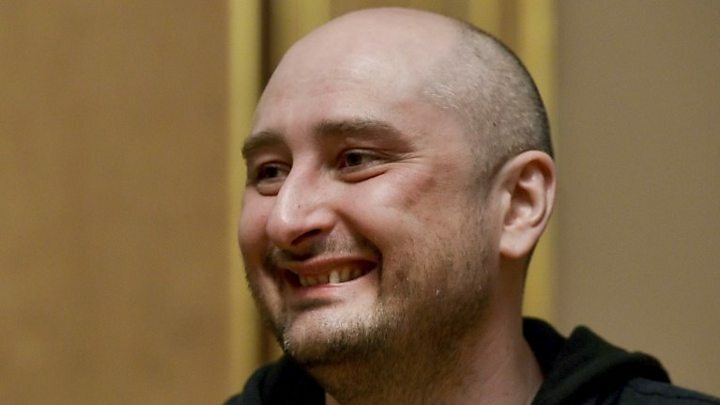 Media captionFriend of Babchenko: "We’ve all been hoodwinked"
There can be few more glaring examples of 'fake news' than the deliberate misreporting by a sovereign government of a prominent journalist's death. Relations between Russia and Ukraine are at an all-time low, following Moscow's annexation of Crimea and the ongoing conflict in eastern Ukraine, and Russia has been accused of several recent deaths of Kremlin critics in Ukraine. But this staged non-death will inevitably muddy the waters. Russia already denies any involvement in the attempted assassination of its former spy Sergei Skripal in the UK city of Salisbury in March, calling it fake news. It will now likely seize on this deception in Kiev to strengthen its claim in that case, and in others. Kiev has in recent years seen a number of deadly attacks on high-profile figures, including journalists and politicians. Most of them were vocal critics of the Kremlin. The leading Belarusian journalist and Kremlin critic, Pavel Sheremet, was killed by a car bomb in Kiev in July 2016. Another car bomb killed Ukrainian military intelligence officer Col Maxim Shapoval in June 2017 in what the Ukrainian authorities called a terrorist act. In March of the same year, former Russian MP Denis Voronenkov was shot dead outside a hotel in Kiev.